LQQking for a true, genuine, DNA tested, Irish short legged Jack Russell Terrier? We are passionate about Terriers. Combining this passion with a never ending quest for knowledge and our love for history and genetics, this project was naturally, something we had to pursue. After years of research, in 2008 we found a team of geneticists in the UK with science based capabilities to dig into the genetic background of the Connemara line. After discussing the Connemara's verbal history, with great enthusiasm, they agreed to help us. We then stepped aside allowing generations of told history of the Connemara to be challenged. We were even asked before it began; “Are you sure you want to know?” …As the history was about to be put to the test. Everything we had been told about the lines, was about to be challenged. I can admit now that I was quite apprehensive. We had blood drawn on a representative sampling of the line and complex gene testing began on eighteen Connemara Terriers. This initial genetic testing took several months to complete. I was told by the head of the genetics team that discovering what breeds were used in the creation our lines would be like to “peeling an onion, one layer at a time.” The entire project took a couple of years and now we share this information with you. 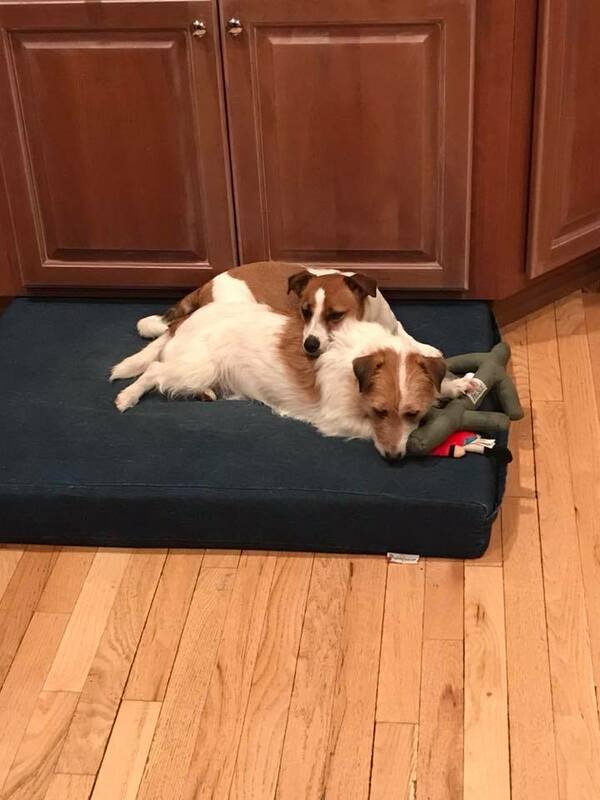 Our terriers are a specific old line/strain of Jack Russell Terrier - Not to be compared to the faddish “Irish Jack” puppy mill mixes (or descendants) being peddled and sold in America. The fact that the Connemara is Irish has nothing to do with their quality. We've argued that being Irish itself does not make them anything special; It’s actually the fact that they have been carefully bred in Ireland for well over a century to maintain their manageable and agreeable temperaments and superior health. Making them fantastic pets who would get on well with small children, other dogs and cats. A dog’s genes carry information a physical exam can’t reveal. Complex genetic testing is the only true way to find out what ancestry any Jack Russell Terrier breeder can claim. Genetic markers: These are the places of variation in a dog's genetic structure. By studying similarities and differences in these markers among different breeds, scientists are able to determine characteristic signatures in each breed. Breeds can have different genetic breed signatures in different geographical regions, particularly with comparison to the same breed in say Europe or Australia. Due to these geographic variations, it is possible to determine what country a dogs more recent ancestry hailed from. When the Connemaras were tested, they looked at 25 chromosomes of the 38 available. Chromosome 15 is a size gene – All Connemaras had the Chromosome 15 "small breed" marker. Chromosome P is common to all Terriers. Chromosome P was present in all Connemara Terriers tested. Overall, their DNA was different from US and UK Jack Russell Terrier groups and they were classified as an 'isolated population group’ or in other words; a rare type/strain or breed of terrier. The Connemara showed all of the same, basic markers confirming they are most closely related to the modern day Jack Russell Terrier but with evidence of other breeds (Spaniels and Griffons) in their genetic makeup. We believe this mix has allowed the Connemara to remain recognizable as a terrier yet not have the same hyperactivity or aggression issues seen in many Jack Russell Terrier types today. 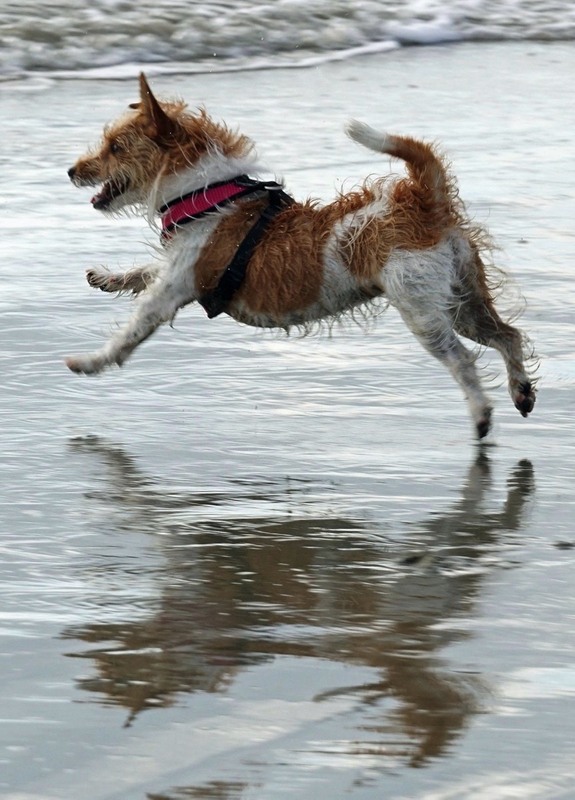 The Connemara Terrier's Chromosomal match scores (as a group combined) proved they are in fact a sub-type of Jack Russell Terrier and predominantly Terrier with evidence of Spaniel & Griffon types. The Connemara is clearly differentiated from the UK and US Jack Russell Terriers and in fact, because this line has been bred with no outside influence for generations, their DNA has begun to morph and they are on the fence between being a clear and distinct sub-type of Jack Russell Terrier and their own breed altogether. 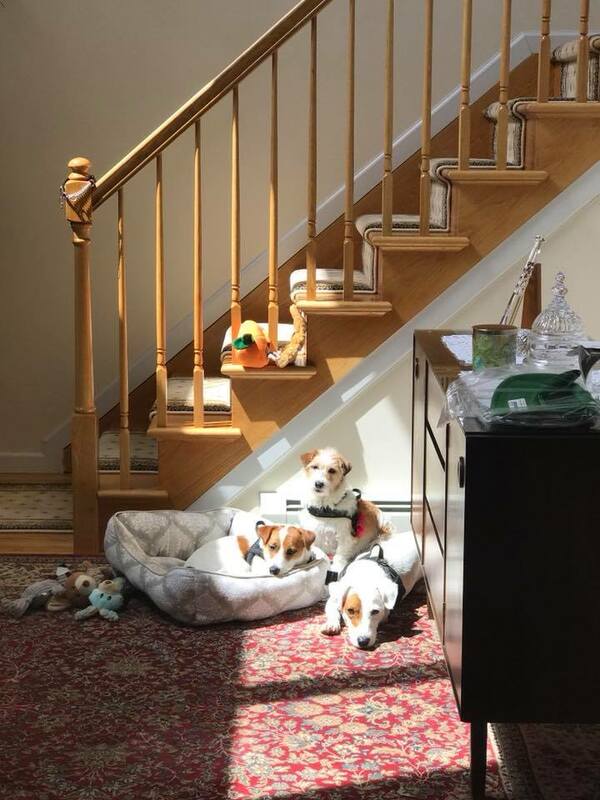 What we know is that by the late 1800s, the Connemara Jack Russell Terrier had become a mainstay on a handful of farms in Ireland. This terrier eventually developed a following of it's own and a select few enthusiasts made it a lifetime commitment to protect the desired attributes, keeping out undesired traits and eventually producing their own type. The results from their efforts yielded a sane and manageable terrier that came in three coat lengths, was on average 10" tall and when measured was longer than tall. As of 2015, we are unaware of any other lines of Jack Russell Terriers in the world that have been put through this testing. Other lines/breeders continue to state the history of their lines and what breeds were originally used in their development without ANY DOCUMENTED PROOF WHAT-SO-EVER. I believe it is worth noting this fact here. 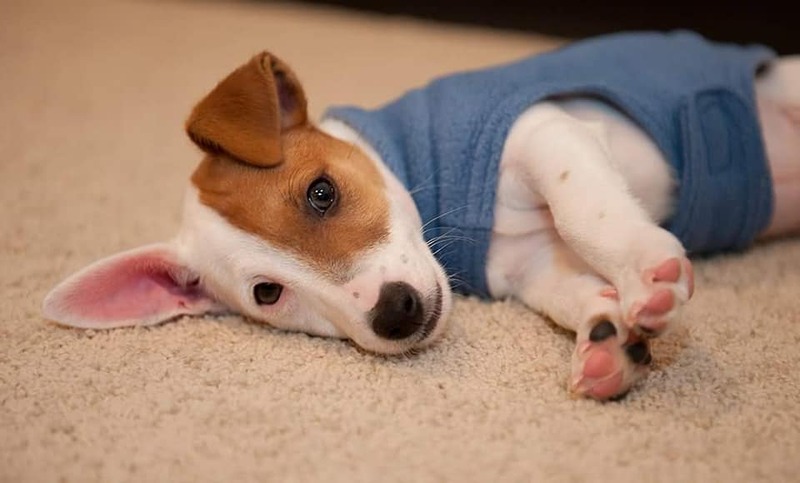 Jack Russell enthusiasts and experts have argued for decades about what a “true” Jack Russell Terrier is. We, so far have been the only ones to put our terriers up to be tested against our verbal history. If anyone is aware of any other lines who have done the same, we would very much enjoy reading their documented, DNA certified history too. Please let us know! "Ziggy & "Clover" love to go biking and boating in New Jersey. If you introduce your jack russell to these activities early, they will be more likely to enjoy them throughout life. 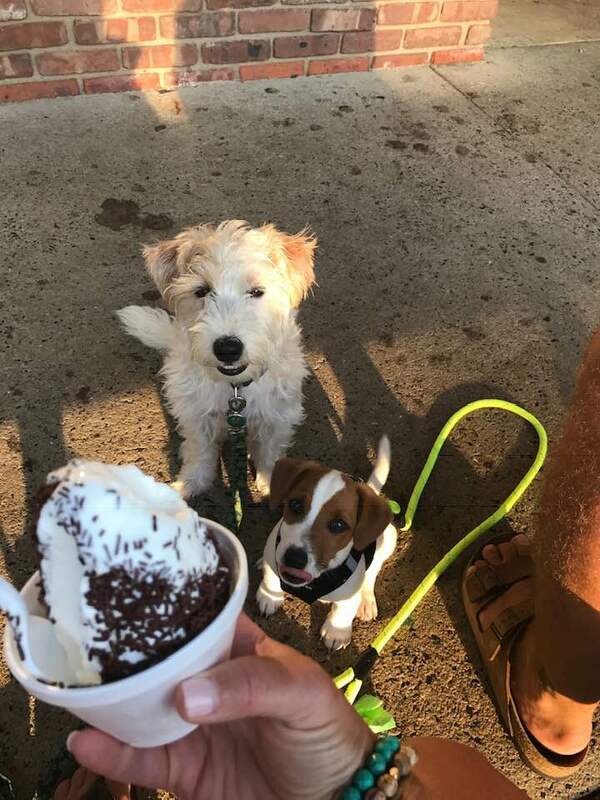 Tucker & Muddy visit their friend Inisheer quite often in New Jersey, Inisheer runs the show! Both Tucker and Muddy are polished puppy kindergarten graduates. 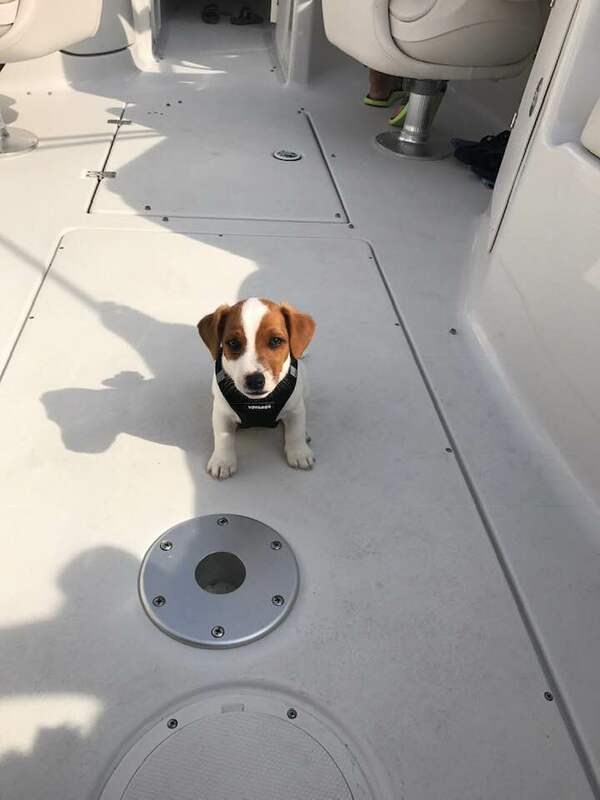 Here's "Ziggy" going out on the waters of New Jersey. 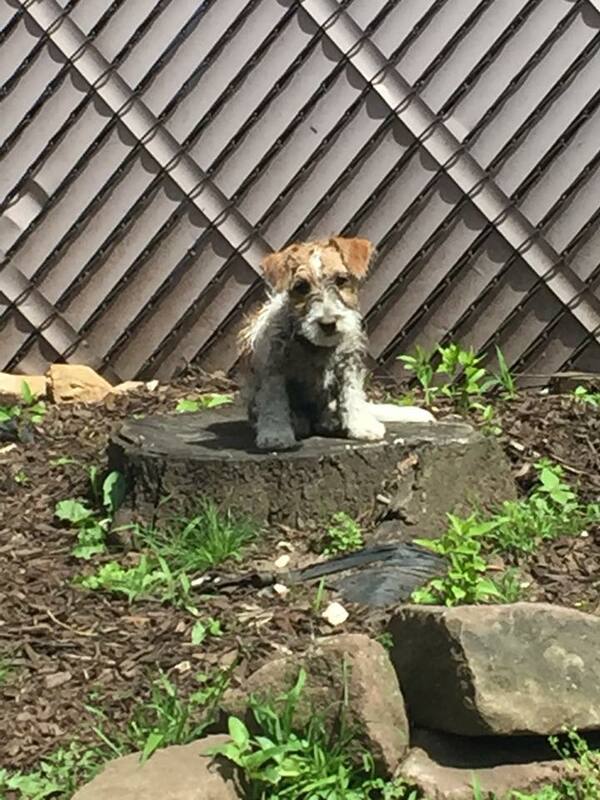 He's a cool little jack russell. "Maeve" & "Jasper" love to watch the water out their windows in Jersey.